We finally made it to SPAC to see the New York City Ballet! I’ve been meaning to go for years. They’re here, for what? Two weeks or so each summer? And every year I’m either away on vacation or it’s storming on the night I planned to go or something else ridiculous happens to thwart my cultural appreciation aspirations. This year my clever and motivated friend invited me along to American Girl Night (sponsored by Emma Willard School). Even though we were tired from our weekend away, I couldn’t pass up a free ride with excellent company. The more the merrier! Also driving and navigating intimidates me. Because I’m a bit of a loser. My friend was rewarded for her motivating karma with a brand-new American Girl doll, Kanani, the girl of the year, for her daughter! We weren’t even at the raffle area, but M was, along with her friends, and she ran to alert her. It was thrilling for all of them. 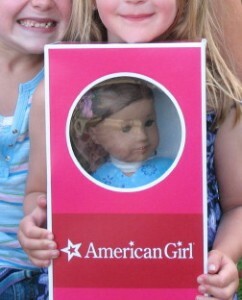 Besides the raffle, Cute W just asked me, what makes it an “American Girl” night? 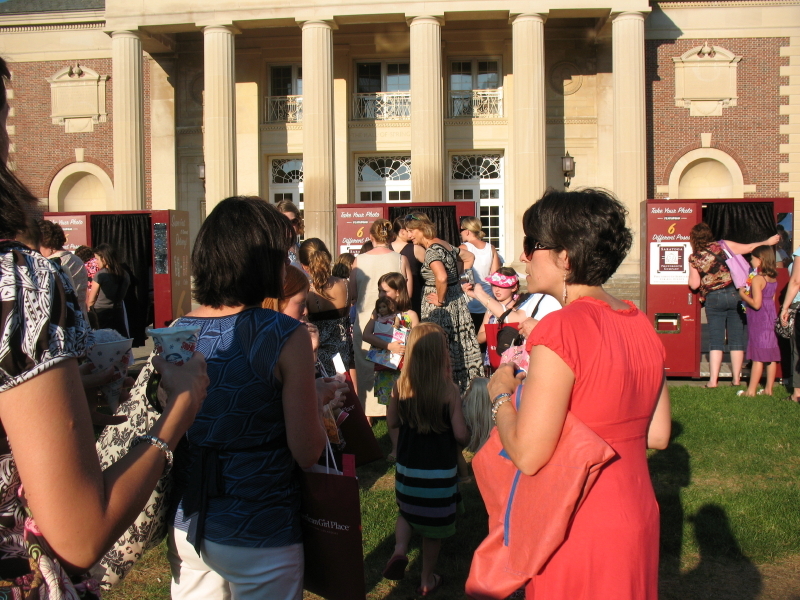 There were three crafts (stickers on a cardboard visor, ribbons to tie onto a ponytail holder, and a lei to assemble), tasty treats (sugar cookies and snow cones), and terribly popular photos taken in photobooths from the Saratoga Photobooth Company. Also little bags and magazines. All included with our lawn tickets, which were $20/grown-up and $5/child. We had an excellent time. J had her buddy L, and M ran into some friends. The actual ballet, for them, was an afterthought. But I’d go again. Understand that other girls will bring their American Girls, possibly wearing matching outfits doll-girl outfits, possibly very overdressed with heels, while others will be in shorts. That’s okay. Embrace it and do as you wish. Pack camp chairs even if you don’t want to sit in them because when people set their chairs directly in front of your blanket, you will resent them. You will wonder how they can sit directly in front of your six-year-old. Let go of this resentment and, instead, bring camp chairs or an extra blanket for a buffer zone. Snack in the car as you drive to arrive at 6 pm. But don’t eat all of your snacks/dinner yet. Snag a spot, and then, if you’re there early, head for the photobooths first, because those are the longest lines. Then, after that, eat some free treats. By 7 or 7:30 pm, you will hopefully have scooped up all possible AG swag, so settle yourself down and eat some dinner on your blanket. So, really, my suggestion would be to bring along someone who doesn’t care about the ballet to take over at this point (perhaps your husband?) so that you can watch the dang ballet. Really, come to think of it, your husband would also be good at helping hold all those AG dolls and bags full of crafts before the show, too. And then coordinate with some friends and when the ballet starts, the people who are interested in the ballet can slip over to another blanket very far away from your children’s blankets. Also, in that case, bring wine. Hopefully you’ll have a friend who is pregnant to graciously drive the grown-ups home at the end of the ballet. And if you don’t plan ahead, with the division of labor and the wine and all, maybe you should all just leave at intermission (about 10 pm). Because 2 out of 3 girls who drove home with us were asleep before we hit Ballston Spa. We sat alllll the way at the front of the lawn, just before the amphitheater. Nobody blocking the view and the wee ‘corps de ballet’ that gathered to dance on the concrete was as much fun to watch as the dancers on stage.